I recently was asked about the cost of buying out one group of Ontario solar contracts. The microFIT (feed-in tariff) contract exposure I estimated at $3.9 billion. This is the eventual cost of all your neighbours' panels, but not the larger arrays, which I estimate will cost another $33.9 billion. Call it a $38 billion liability which matches the most famous liability in Ontario's electricity sector history: the $38 billion attributed to Ontario Hydro at dissolution in 1998 - liabilities attained in building almost all of the province's generation, its transmission infrastructure, and much of its distribution infrastructure. The solar contracts that carry the $38 billion total will produce about 4.3 terawatt-hours (TWh) of electricity a year, which is roughly 3 percent of Ontario's demand. This solar story is about the failure of the global adjustment mechanism. Recent media reports indicate the current government is looking at the "global adjustment" in examining how to cut hydro bills - which indicates they aren't too sure what it is, so an explanation is in order. In 2004 the Minister of Energy, Dwight Duncan, sketched out reforms of the electricity sector in a speech to the Empire Club. At the time the province was seeing little appetite for private investments in the sector (following a rate freeze). New supply was needed as a new Liberal government had come to power promising to end coal-fired generation in the province quickly, and the debt remaining from the old Ontario Hydro was not being retired. Under Duncan a system was introduced that allowed for the full recovery of power purchases from consumers - facilitating the contracting of the supply to displace coal. It is the difference between the price the government promised any particular electricity generating company and the “market” price of electricity. In one way, the GA had remarkable success. I have already noted the historical Ontario Hydro was deemed to have had $38 billion of debt and liabilities when disbanded, and considerably fewer assets. Notably, these liabilities included $4.3 billion for the non-utility generator (NUG) power purchase agreements signed in the late 1980's and early 1990's. The difference between liabilities and assets is referred to as the "unfunded liability," which landed with the Ontario Electricity Financial Corporation (OEFC). The introduction of the global adjustment allowed and the full cost of generation to be recovered (including the full cost of old NUG contracts). The finances of the OEFC showed immediate, and persistent, improvement. 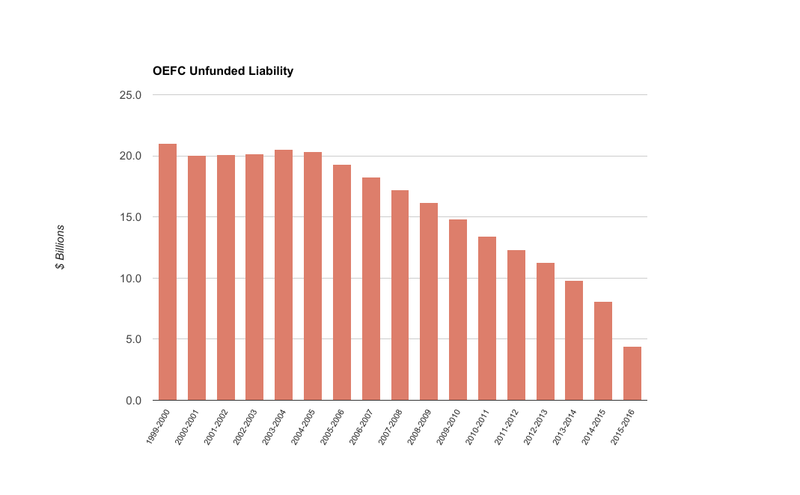 The debt held by the OEFC has dropped a small percentage of what they claim the unfunded liability has. This seems authentic to me, but it is because generators are paying back loans comfortably specifically because they hold rich contracts for their output. The NUG contracts were a liability for Ontario Hydro because it was not considered possible to recover their contracted costs from ratepayers. This seems exactly the issue the government is dealing with today. With the government panicking about electricity rates, it seems unlikely they'll recover the full cost of contracts from rates - the specific intent of the global adjustment. The question is how did we get such expensive electricity, and the simple answer is that we contracted it. Since 2008, and never so significantly as in 2011, there is no value to the production of electricity without an existing contract for purchase of the production, outside the uncertainty of market fluctuations. The value is in the contract - not in any competence in efficiently generating electricity that can service demand for electricity. This answers the question as to who this 'market' is supposed to work for – whoever the government chooses it should! Today the government is trying to cope with the inevitable outcome of this scheme. The changes that initially brought the global adjustment were part of what Minister Duncan referred to as a planned "hybrid" market. By 2008 demand for electricity in Ontario had started to deteriorate and wholesale market pricing dropped accordingly. In one sense supply adjusted accordingly too; the last major new firm generating station Ontario contracted was an Oakville power plant, in 2009, specifically to service one area of growing demand. While this contract has proceeded to be ridiculous, it is an insignificant cost compared to other post 2008 contracting. The IESO's listing of contacts contains renewed contracts, and contracts for renovated power plants (such as coal-to-biomass conversions), but through filtering the list to include only new-build power plants it's clear the vast majority of contracted capacity since 2009 is solar (31%) or wind (65%). To be clear, the 6,430 megawatts of these sources contracted after 2009 is irrelevant in the replacement of coal-fired generation as all the capacity to accomplish that was previously procured. While the eventual cost of contracted solar supply will be approximately $38 billion, we also should present an asset value (the resale value of the power produced over the 20 years). Estimating this value will be very contentious, but I'll choose to value the output at $156.7 per megawatt-hour (MWh), which is the value of the projects contracted in 2016's Large Renewable Procurement (LRP). This is as fair as possible given 2011 and 2015 reports from the Office on the Auditor General of Ontario document the cost of Ontario's excess electricity supply, which is expected to continue for at least a few more years - nothing needed to be contracted at higher rates after the recession of 2008-09. The $156.7/MWh values the approximately 4.3 TWh of estimated annual output, over the 20-year contract term, at $13.5 billion. With the contracted cost being $37.9 billion, the net liability of solar contracts is therefore estimated to be $24.4 billion. Solar's $24.4 billion stranded liability, conservatively estimated, is not a novel event: 11 % of Ontario Hydro's liabilities, at dissolution in 1998, were due to Non-Utility Generator contracts a previous Liberal government fancied a good idea. That chunk of the "unfunded liability" was essentially eliminated with the introduction of the global adjustment - and another $2.3 billion of the liability was addressed with nuclear funds agreements. In hindsight, Ontario Hydro had little actual stranded debt - we've seen years of electricity cost increases well above the rate of inflation, so it's obvious rates could have recovered most of the costs. Solar technology is not the only source of the new unfunded liability. Ontario now has contracts for over 6,000 MW of wind capacity - with over 70% of that contracted after demand and pricing collapsed in 2008-09. Should all projects proceed to completion (some could still be halted by an astute government) I expect annual generation of approximately 16.8 TWh at a cost of $2.1 billion a year - totaling $42 billion over the 20-year contract terms. Again valuing the production at the last contracted price (the LRP) of $85.9/MWh, the annual losses will be $684.2 million, and 20 year term contract losses $13.6 billion. The $13.6 billion net liability of wind, added to the $24.4 billion net liability of solar contracts, produces a $38 billion net liability, which equals all of Ontario Hydro's gross liabilty, before valuation of its/our assets. It is important to remember that what makes these unfunded liabilities is the inability to extract greater amounts from the ratepayers of the province. The global adjustment was treated as a tool to spend any amount, as if the ratepayer was an endless source of funding, but the limitations of irresponsible contracting seems to have been found. As the Premier discusses addressing the global adjustment, she needs to be aware that what she is discussing is recognizing the losses of her predecessor's experimentation with the province. None of my figures account for inflation. Only a portion of contracts are indexed to inflation (the most expensive originally, which are not the earliest, also have the highest escalators). To be clear, I have not attempted to manipulate figures to present a "net present value" of contracts.